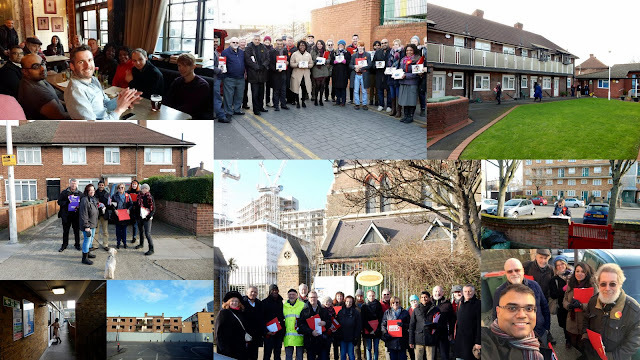 Picture collage from today's "Super Saturday" campaign in support of Sadiq Khan as London Mayor. Around 20 activists turned up to work with West Ham MP, Lyn Brown, in Canning Town in the morning and a similar number in the afternoon in Forest Gate. Greater London Assembly (GLA) candidates, Unmesh Desai and Tom Copley, also turned up to talk to residents. After the Forest Gate session, canvassers revived themselves from the cold weather with hot coffee (or cold beers) at the Forest Gate Tavern. It was great to see new members to the Party take part and campaign for Labour alongside existing activists. The London Mayor and GLA election in May will be by proportional representation so every vote will count. It will be absolutely vital that we get the Labour vote out in Newham.